This dosa can be eaten anytime. This is commonly given to Nursing Moms who fee their babies. Soak Methi seeds for 2 hrs. Soak Rice for 4 hrs. Grind Methi seeds & Rice to a paste. Donot add too much water. 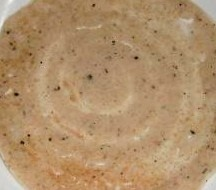 The batter should be thick like normal Dosa batter. Remove to a bowl. Add Salt & Pepper powder. Mix well. No need to ferment. Heat Tava & apply little oil. Spread a ladle full of batter. Put some Ghee on top & around it. Cook for a minute & Flip to the other side. Serve with Coconut Chutney. Note : The batter will be sticky & cannot spread like normal Dosa. Hence the dosa will be thick like Uttapam. It will taste bitter as Methi seeds are bitter in taste but very good for health. I feel 1cup methi seed to 1/2 cup raw rice is too much and would make the dosa bitter. I take methi seeds soaked in water overnight for high bp, the water is bitter to the taste when drinking, so I am just wondering as to the propotions given in your recipe.